Thousands of neglected and underutilized species (NUS) of crops offer tremendous opportunities for food and nutritional security and have the potential to improve rural people’s livelihoods. When we refer to NUS, we are often told that if these species are underutilized, there must be a reason why. And indeed there is. The trouble is that the reasons are often not good ones: they are often based on misconceptions; production or marketing bottlenecks that can sometimes be easily surmounted; lack of information on the cultural, nutritional and environmental properties of these species etc. This event was organized by 4 organizations, namely Bioversity International, the International Treaty on Plant Genetic Resources for Food and Agriculture (FAO), Oxfam Italia and the IFAD. We chose the TED talk format, with Stefano Padulosi from Bioversity International telling us stories from rural communities from all over the world to understand the importance of NUS. 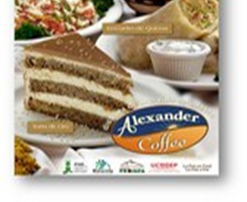 The main protagonist was a cake, made out of quinoa (an Andean grain) and sold in La Paz’s version of “Starbucks” – a place called Alexander Coffee. This very special cake is the result of a 10 year project funded by IFAD that involved hundreds of people from poor communities across Bolivia. Being able to enjoy this cake in Alexander Coffee means that we have been successful in conserving NUS and making them competitive on the market and attractive to all those who go to there. Quinoa has been cultivated for centuries in the Andean region. It is very nutritious as an important source of protein and iron. the Incas considered it a sacred crop, and the emperor would traditionally sow the first seeds of the season using implements made of gold. But now it has become a NUS and is considered 'poor people's food'. A fundamental problem with quinoa is that its preparation is painful. Quinoa seeds are coated with a layer of saponine, a bitter and toxic alkaloid. To get rid of this layer, women first toasted the seeds on a metal tray over a fire. Then the hot seeds are tipped into a stone basin and the women tread them with their bare feet, causing blisters and chronic lower back pain. Moreover, this process can take 6 hours to process 12 kg of quinoa. The project provided the target group with a machine to remove the saponine and what previously took hours now was done in just 7 minutes. NUS are often also important as medicinal and aromatic plants – for example wild fennel. In the Errachidea province in Morocco, the value of this herb is currently neglected and consequently its exploitation is underutilized. New generations are slowly forgetting the knowledge and traditional use of these plants. However, these plants can be an important income opportunity for poor rural communities. In the case of wild fennel, its cultivation (instead of colleting it directly as spontaneous plant) in one year may improve the average household income by 75%. Thanks to a project by Oxfam Italy, 33 families in the villages of Sidi Boukil and Gourama are now learning how to promote these herbs in the markets thus improving their livelihoods. Creating an enabling policy environment – both at national and international level – is necessary to deploy the economic potential of NUS for the poor. Thus, the role of the FAO International Treaty for Plant Genetic Resources for Food and Agriculture is pivotal for supporting NUS, in terms of more sustainable conservation and a wider use of agrobiodiversity. Several Grants have been awarded by the Treaty to organizations around the world, via its Benefit Sharing Fund. This is a great contribution towards the creation of a more secure food basket for the world. In sum, NUS have a great potential: they can increase incomes, enhance nutrition and preserve the culinary and cultural traditions of indigenous communities. Moreover, these crops are often better adapted to grow in marginal areas, with little need for irrigation, pesticides and fertilizers. In many instances these species are the only crops that can cope with harsh environments unfit for other crops. And they can also play an important role in boosting responsible and sustainable tourism.